It's my first time to wax my hair on my finger toes. I was really excited to do this not minding how painful it would be because I feel conscious everytime I see hairy toes. The hair on my big finger toes are really long. I feel 'diyahe' everytime I wear sandals and my friends notice how long they are. I didn't know why it took me this long before I decided to wax my feet. I used this brand of wax since I am not really familiar with which to use best. I got this from Watson's so I guess this is a good buy. 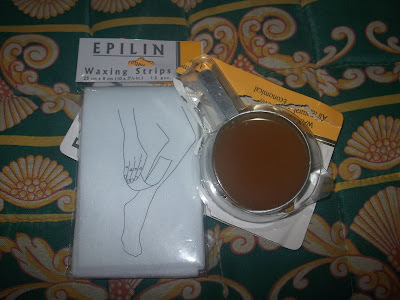 I was so stupid when I buy the waxing material. I wasn't able to use the was right away because I forgot to buy waxing strips. I was very excited pa naman. This is how my feet looks when they had long hair. It's eewww!!! This is my new feet. When I tried to pull the strips up, I lose my guts. Masakit pala. I know it's my first time so I had no choice but to pull the strips. When I got the hang of it, I enjoyed it a lot. Pain is beauty, and no pain no gain. Haha! This is how my feet looks after waxing them. Now, I can be confident with my feet even if I wear sandals or flipflops. I also have hair on my toes but it's thin naman so I don't think I have to wax it yet. Super ouch kasi yun eh haha. Tried waxing my underarms before and it was like hell. @ Madz, I tried Veet cream before parang ang hirap maalis yung hair eh. Veet has also ready to use waxing strips. Will buy that pag naubos na wax ko. You're courageous sis! ;) good thing you can do it yourself. i am afraid to try a do-it-yourself waxing. I might do it wrong. Instead, I used to go to lay bare salon for my underarm waxing. Now you are ready to show off your toes with a beautiful pair of sandals. Thanks, I only go to lay bare for my underarm and eyebrows.